You know the old saying 'that joy is in the journey'? Well, let me tell you, Dear Ones, joy is also getting there and finding pretties! Yes, I said pretties and at a bargain. That's what we decorating treasure seeking gals are all about, right? We are about other things, but I must say this because of my post today. While out on my journey to find joy, I stopped into my favorite little thrift store and look what was in a plastic bin and it said 10 cents each! I rummaged through and found these six little beauties - only two were silver, the others silver plate - but that's okay. A swipe of my good ole silver cleaner and these little pieces will give me much more joy than just the sixty cents I gave for them. Look at the beautiful detail in the little ladle or dipping or whatever it's called? spoon! A little blurry, but I think you can see the joy here also! Oh, my heart just skipped three beats with I saw this adorable little child's tea pot. This brings back memories of joy from my childhood. So I had to have this, too! Can you find joy in an old hand painted biscuit jar!? Well, sure you can - even without the cookies in there! Believe me dear joy seekers, this is so much prettier in person. I almost fainted when my little gorgeous baby blues set their sight on these dishes! There were eight dinner plates, eight dessert plates, eight bowls, eight smaller bowls and eight cups and saucers! Joy joy joy! No serving pieces, but my joy is still joying strong. Look at this beautiful detail on the plates. I know nothing about this brand, maybe some of you do. But I do believe it's an older set and it's in great condition. Now look at the precious cup and saucer! Even the pattern is inside the cup! Oh, my joy runneth over! Now, I love Marshall's Home Goods just about as much as most of you do! Joy just streams out of the doors of this place just like the air conditioning on these hot summer days! Do you see these pretties?! I'm really trying to constrain myself here, these pretties match my Blogland teapot!! Oh joy! Never mind! JOY JOY JOY! I had to have these joyfulnesses. Now a little joy escaped me, just a bit, because I would rather have had tea cups and saucers instead of mugs. But since this design is so divine (I'm a poet and didn't know it!) I had to have all four of the mugs anyway. Now my joy meter is back up! This piece is just so beautiful, don't you think? The shape is so fancy! I wish I had a rose bush. Wouldn't some fresh roses look awesome placed in here? Back to the treasure seeking that brings so much joy to us all! I was so pleased with all of my joyful pieces and turned to leave the store when...I saw this beautiful matching candy dish! My heart is skipping beats again and joy is sputtering all out of me! That doesn't sound just right does it? Well, you know what I mean - I'm a happy joyful girl!! Woo Hoo! Joy had won again - I had to have this too! This is what started the joyfulness of the above purchased set of pretties - my Blogland teapot! I have affectionately given my teapot this name because I have seen her in the different homes of many of you bloggers bringing such joy and delight! Here is a wonderful set of Joyfulness! This will bring me joy for years to come. I can put joyful candies in the dish, drink joyful teas from the mugs, put joyful flowers and maybe joyful liquids in the pitcher. Last, but not least my Blogland teapot who has already given happiness and joy, will hold warm water for my tea ~ think of all the joy I'm going to have now! Go as fast as you can to your favorite drive-in (yes, it must be a drive -in, because you're not capable of walking) and order a chocolate milk shake. You can order vanilla, but don't drink that one, only drink the chocolate. You can't imagine how the joy meter begins to fill up! Thank you all for coming along on my journey to joy! It doesn't tell me WHEN this china was manufactured...but gives ALOT of information!! And lists other pieces they offer. Ohhhhhhhhh...I feel the JOYfulness in your finding the beautious items to match your TEAPOT!! I can't wait to see what JOYOUS, BEAUTIOUS items I might find this morning at one of the popular Church Sales...I gotta get going...JOY time is coming soon!! Great eye in finding these treasures that bring you such JoY! Sounds like you had a great day hunting for treasures. My favorite kind of day too. See you tomorrow at the Tea Party. Every thing you shared is so pretty! I really like that biscuit jar. The colors are wonderful. Your dishes are stunning. All that matching is perfect! I love to coordinate! Did you make a haul or WHAT, sweetpea?!?!?!?! My gosh, that's fantastic! I think it's about time for another trip to Home Goods for this little chick! Woooohoooooo for you! Absolutely lovely finds, Shelia! I would be joyful, too. I love love love the pitcher! It's soooooooooooo pretty! Where do you put all this stuff?! I love the silver, I really need some more serving pieces. What's up w/ the bathroom shots? Sorry I didn't get one to you, I haven't left my house until today. BUT, when I am on vacation next week I will get pictures in all sorts of public restrooms for you. Some of my mom, too! Is that OK? What lovely finds you did find! The pattern of the china is beautiful. Another to add to your lovely collection. Enjoy and have a lovely day.. Wow!! 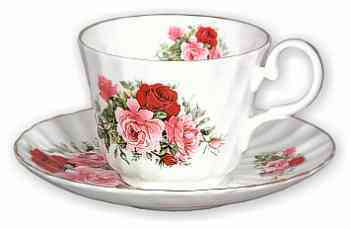 You realy had a joyfull day.I love the tea set...soooo preaty. I love the set of china for 8. Now, with you, Mr. Precious, me and Johnny, who else will you invite for dinner? Yum Shelia, that biscuit jar is gorgeous. I have a little broken teapot and a few plates sort of like it and they are some of my favorite pieces too. Your Homegoods finds are so awsome. I have been looking for some of those pieces since Cindy at My Romantic Home first posted about heres but our Marshall's hasn't had any yet. We really need some new coffee mugs and the ones you show here would be perfect. I'll keep lookin' I guess. I have a weakness for old silverware. When I saw yours I knew you had found a treasure. And what gorgeous dishes you found. Your 'finds' are all beautiful. Wow Sheila , you hit the mother load honey ! The purple flowered set is so pretty ! And I love the Marshall's pieces . Our Marshall's doesn't have these yet or someone is swiping them up before I can get there . Have a blessed day dear. Congratulations on your lovely finds! Edward sends greetings to Chloe Dawn! Oh, I love the mug with the flower design down inside it! That would make me happy as I drank my coffee and the flowers emerged! You have worn me out girl! Did all those finds fit in your car? They are opening a brand spankin new Homegoods by my precious little house! I see some joy coming in my near future too! Hubby says Boo hoo, I am saying Woo Hoo!!! Woohoo! I'm sharing in your joy! What beautiful finds! My favorite is that gorgeous, splendid, amazing hand painted biscuit jar. Everything is is fantastic too! Since I was a Bathroom Beauty Snapper, I decided to snap my whole bathroom tonight! Pretty pretty things. I love the little teapot with the birds..that one just made me smile! OK , I just loved your post. You are so funny. I am one of those joy, blogland, Marshall shoppers who bought the same design. I still want the tray but I've had no such luck. I never saw the teapot either. You are definetly blessed. Well TJ MAxx just got the same design their so I will keep looking. Hugs. I love your dishes. I'm an admirer of beautiful china and crystal collectables, too. I actually have a sugar spoon like one you found - it was my Mom's, so is even more special to me. This is just the sort of thing that gets my bodd racing! I LOVE dishes and china and silver and wow. The little tea pot is just too precious! Gee do I love how you describe your experiences. You are a pure joy to read. I adore you!!! Ummm...some GREAT finds here! I love every single one of them. Thank you for visiting my blog! You have some WONDERFUL thrift store finds. WOW! I can't believe you paid 60 cents for that silver! Way to go! Love love all your treasures! Wow!